Politics • Six Utahns call the official votes a "bittersweet" honor as Obama still prevails. Kim Raff | The Salt Lake Tribune (middle) Official Electoral College voter Thomas Wright fills out his ballot for vice president of the United States during Utah's vote in the old Supreme Court chambers at the State Capitol in Salt Lake City on Monday, Dec. 17, 2012. 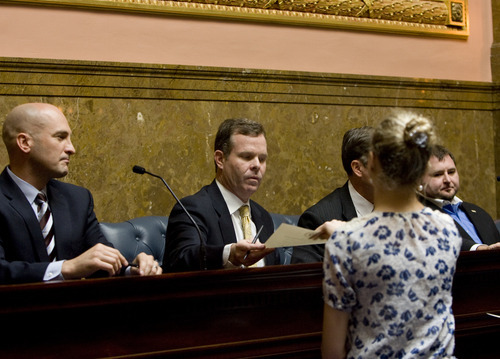 Kim Raff | The Salt Lake Tribune (middle) Attorney General-elect John Swallow signs his ballots for president and vice president of the United States during Utah's Electoral College vote in the old Supreme Court chambers at the State Capitol in Salt Lake City on Monday, Dec. 17, 2012. 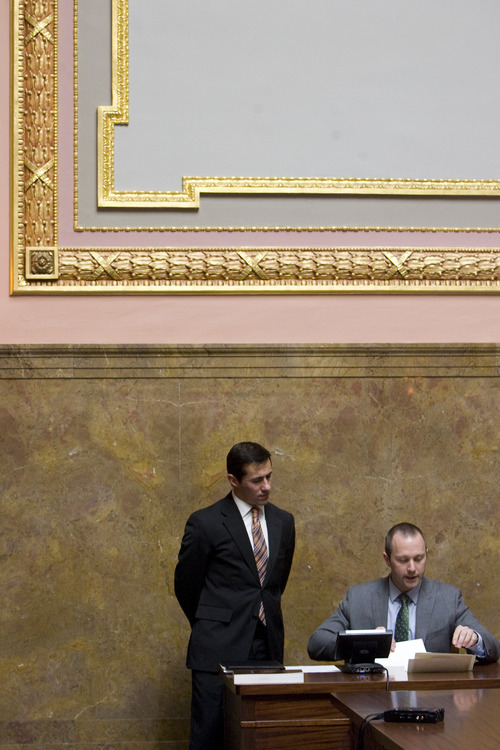 Kim Raff | The Salt Lake Tribune (middle) Attorney General-elect John Swallow fills out his Electoral College ballot for vice president of the United States during Utah's vote in the old Supreme Court chambers at the State Capitol in Salt Lake City on Monday, Dec. 17, 2012. Kim Raff | The Salt Lake Tribune (left) Justin Lee, deputy director of elections, listens as Taylor Morgan, election specialist, reads aloud the results of the Electoral College's ballots for vice president of the United States during Utah's vote in the old Supreme Court chambers at the State Capitol in Salt Lake City on Monday, Dec. 17, 2012. Kim Raff | The Salt Lake Tribune (left) Justin Lee, deputy director of elections, listens as Taylor Morgan, election specialist, reads aloud results of Electoral College ballots for president of the United States during Utah's vote in the old Supreme Court chambers at the State Capitol in Salt Lake City on Monday, Dec. 17, 2012. Kim Raff | The Salt Lake Tribune Lt. Gov. 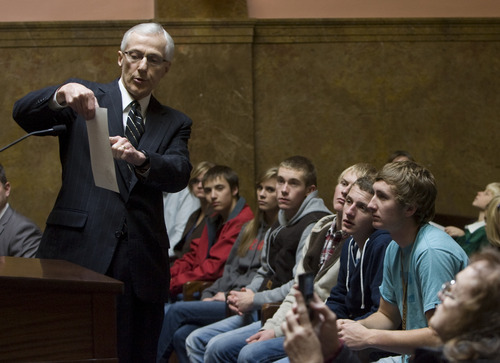 Greg Bell shows an electoral ballot for the vice president of the United States to students who came to observe Utah's Electoral College votes for the president and vice president in the old Supreme Court chambers at the State Capitol in Salt Lake City on Monday, Dec. 17, 2012. 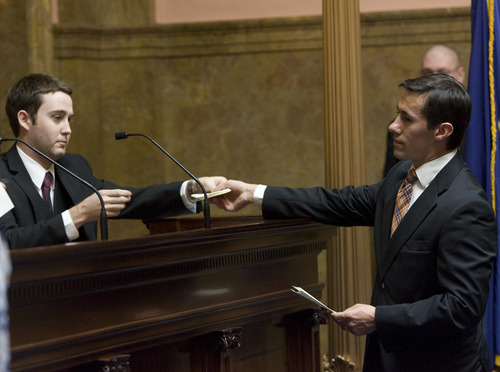 Kim Raff | The Salt Lake Tribune (left) Attorney General-elect John Swallow hands over his ballot for president of the United States to Laurie Decker, during Utah's Electoral College voting Monday. 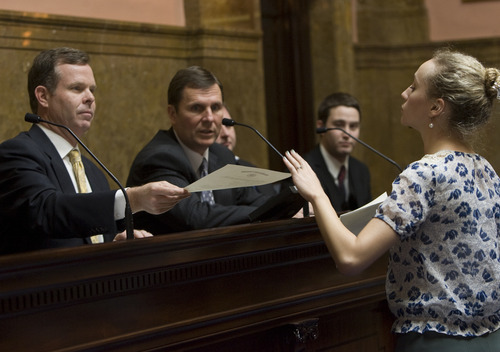 The same process was repeated in state capitols throughout the country. Kim Raff | The Salt Lake Tribune Official elector Fred Lampropoulos fills out his ballot for president of the United States during Utah's Electoral College vote in the old Supreme Court chambers at the State Capitol. Kim Raff | The Salt Lake Tribune (left) Official elector Terry Camp hands over his ballot for president of the United States to Justin Lee, Utah deputy director of elections. Monday was the day for electors in state capitols across the country to cast their official ballots. 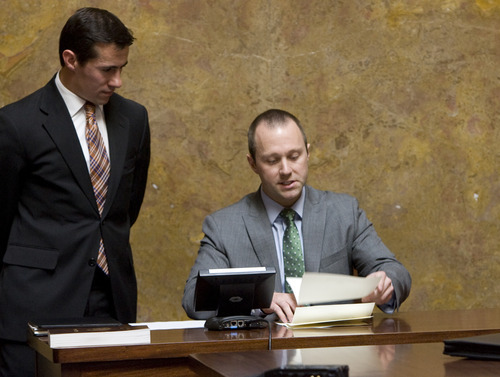 Kim Raff | The Salt Lake Tribune Lt. Gov. Greg Bell shows an electoral ballot for the president of the United States to students from Richfield High School who came to observe Utah's electors cast their official Electoral College votes on Monday. Six Utahns cast ballots Monday in the presidential election that really counts  the Electoral College. Mitt Romney received all those Utah votes, but, of course, he still lost nationally. "Do I wish I were voting for the winner? Absolutely," said Utah Attorney General-elect John Swallow, one of the six Utah electors. "But do I stand in line and say as an American the election is over and I will support the president of the United States? Absolutely. That&apos;s what we do in this country." "It&apos;s bittersweet and a little disappointing" to vote for Romney when it is known that he already lost, said Kyle Hicks, another elector. "But it&apos;s an honor to represent Utah with my vote." The Electoral College gives each state votes equal to the number of its members in Congress  and Utah has two senators and four members of the House, one more than in the 2008 presidential election because of population gained in the 2010 Census. The District of Columbia is also given three votes. In most states, electors are pledged to the candidate who wins the overall popular vote there. "So voters instruct electors, who cast the actual votes," Lt. Gov. Greg Bell told students who watched the voting in the Capitol&apos;s Old Supreme Court Chambers. 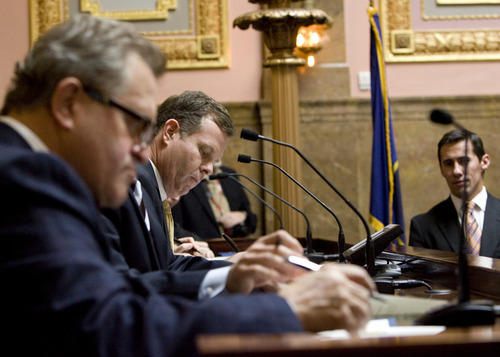 "Today is what counts," said Stan Lockhart, an elector who is a former chairman of the Utah Republican Party. In Utah, the state conventions of political parties vote to select a slate of electors to cast the state&apos;s official ballots if their party&apos;s nominee wins the statewide popular vote. The last time the Democratic electors in Utah were able to cast ballots was 1964, when Lyndon B. Johnson won in a landslide. The Republican slate became the official electors here this year as Romney won 72.8 percent of the popular vote. 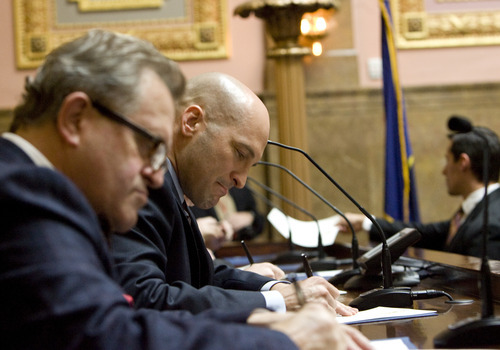 The official electors besides Swallow, Hicks and Lockhart included Utah Republican Party Chairman Thomas Wright; former GOP gubernatorial candidate Fred Lampropoulos; and Terry Camp, an aide to Sen. Orrin Hatch, R-Utah. Two states  Nebraska and Maine  determine how their electors are pledged a bit differently. In those states, one elector is pledged to the popular vote winner in each congressional district, and two votes are given to the winner of the statewide popular vote. Dave Wasserman with the nonpartisan Cook Political Report figures that if every state used the same method as Maine and Nebraska, Romney would have won the electoral vote 276-262. 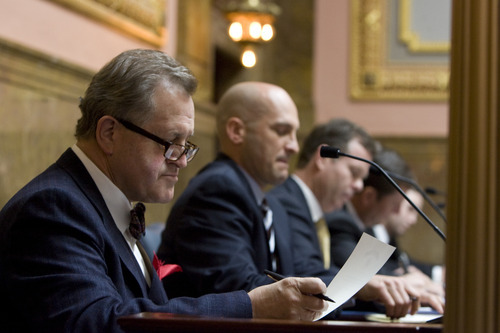 While Republicans in several states are discussing pushing to change the system because of such findings, Lockhart  the former GOP chairman who was one of the Utah electors  said he doubts Utah would ever make such a move. "My sense is that Utah is more traditional in our approach, so I don&apos;t anticipate that things will change," he said. 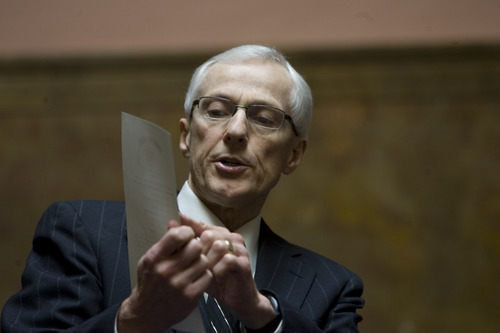 Some Utah legislators have also proposed that Utah join a growing compact of states that would pledge to give their Electoral College votes to whoever wins the national popular vote. State Sen. Howard Stephenson, R-Draper, has said that would help ensure that a candidate cannot win the popular vote but lose the election  which happened in 2000 with George W. Bush and Al Gore, in 1876 with Rutherford B. Hayes and Samuel Tilden, and 1888 with Benjamin Harrison and Grover Cleveland. Stephenson has said it would take focus away from 11 swing states, which essentially decide elections under the current system, and force candidates to worry about all states.